Have a question on Pilot? Pilot is available in 4 different colors - Crystal Black, Silver Metallic, White Diamond and Steel Blonde Metallic. Watch latest video reviews of Honda Pilot to know about its interiors, exteriors, performance, mileage and more. In the mind of numerous buyers, the Honda Pilot is the perfect mid-size crossover SUV by Honda, which was introduced in the year 2002. Its clean and stylish exterior complementing its engrossing internal design and style, yet the seating arrangement for up to 8 individuals, makes it distinctive in its segment. This mid-size SUV is the Honda’s only three-row sporty vehicle which comprises of a long length, although the latest evolution of Crosstour in 2010 has surpassed the Pilot in length. The spacious cabin of Pilot with wide range of advanced features makes you immerse in serene comfort. Its tri-zone automatic air conditioning system lets you set temperature for the driver, front passenger and second-row seats individually. To store extra luggage in the boot space, this car is provided with 60:40 split folding seats. For entertainment, Pilot is embedded with rear DVD entertainment increasing the pleasure of its occupants. The 4 seats appointed in this SUV is employed with LATCH, whereas this car fits up to 8 passengers at a time. Embedded radio/MP3 audio system with 2GB memory has been provided so that you can enjoy your long journeys. Also, the cabin is appointed with 7 speakers to deliver quality sound, along with Aux-in and USB port. The Pilot’s exterior design is forged with a blend of extremes that depicts its bold and refined looks. From its cosmic body style and polished aerodynamic lines to its remarkable radiator grille with energetic HID headlamps, the New Pilot is designed to take you to any destination in urbanity. The appointed power sunroof with slightly tilt aspect gives a captivating appearance to this SUV. The tailgate of this Pilot is employed with lift-up glass to propose versatile and quick access to the passengers. Also, it gives a convenient access to the room boot space of this car. Being an SUV, the Pilot expresses the optimal sporty character with its 18-inch alloy wheels. Exterior dimensions of this sporty car measures as 4875-4919mm x 2232-2243mm x 1845mm (L x W x H), with 2775 mm of standard wheelbase. The all-new trim levels of Honda Pilot offers thrilling eagerness and spontaneity with equipped 3.5-litre SOHC i-VTEC V6 engine with Variable Cylinder Management. With this powerful engine, Pilot is made available in three trim levels named as Pilot EX, Pilot EX-L and Pilot Limited. The 3.5-litre engine is capable of providing increased stability, smooth performance and more durability to the vehicle, while producing the maximum power output as 253 hp at 5700 rpm with the peak torque of 347 Nm in 4800 rpm. Matched with the Pilot’s gasoline engine, the appointed 5-speed automatic transmission with four-wheel drive helps the driver in better handling. This efficient engine delivers the mileage of 8.9 kmpl. On acceleration, this vehicle takes 9.4 seconds to reach the speed mark of 100 km, while the top speed comes at 175 km/h. With its high quality safety elements employed in this SUV, the manufacturer is committed towards occupants safety effectively. The standard safety features of Pilot includes active front head restraint and vehicle stability assist ensuring the safety for those who are inside the car. Also, this SUV is provided with total of 6-airbags providing an impressive protection against injury to all of its passengers. The body structure developed with Advanced Compatibility Engineering helps in boosting the crash compatibility. For safe and secure parking, this product by Honda is provided with convenient sensors and rear-view camera. The flexible suspension dissolves the bounces caused by unpleasant motions on turns, while offering a decent handling to the driver. Honda Pilot perfectly fits the bill for a family crossover SUV with large seating capacity along with Honda's reliability. Do not expect anything very exciting from it. 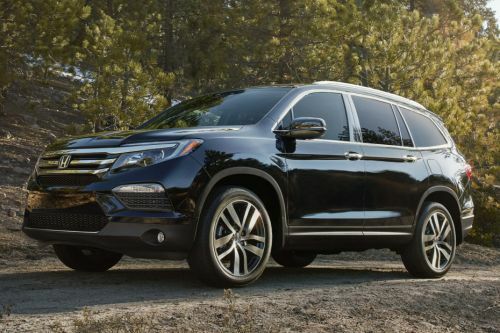 What is the price of Honda Pilot? On road prices of Honda Pilot in starts from AED121,800 for base variant EX 2WD, while the top spec variant Touring 4WD costs at AED181,650 . What are the colors options available in Honda Pilot?